Alrighty. So now that you are holding the ukulele, I know you want to start playing, but first you need to be in tune. A couple of things, first of all, tuning is normal. you will need to tune almost every time you go to play,Ok? Ok! 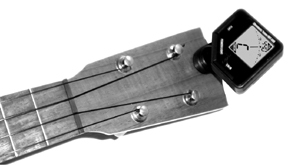 Second of all, if your ukulele is new, it will go out of tune quickly until the strings stretch out and settle in. After that, it will probably only be off by a little. The E string seems to be the worst as far as being out of tune. If it is always wayyyy out of tune, something might be wrong, but a little is normal. As I said before, we will only be dealing in G C E A tuning. 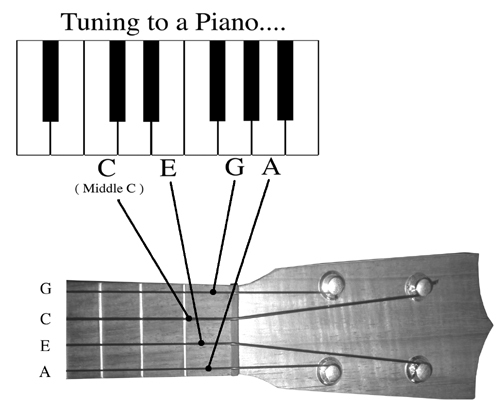 So, Holding the Ukulele with the neck in your left hand, the top skinny string is G. the next fat string is C, the next is E and the bottom string is A. If you are using Piano, here is the deal...It can be a little tricky because you have to hit the piano key, and turn the tuning peg at the same time, and match the two sounds so that there is no "warble" That is how you know you are in tune. So there you are, at the big gig and you forgot your tuner, you check your pockets, no piano either. What to do? Well, all is not lost! you can use the 2-9-5 method. If you know someone with a guitar, they can probably provide you with an "A" note or lend you an "A" tuning fork. 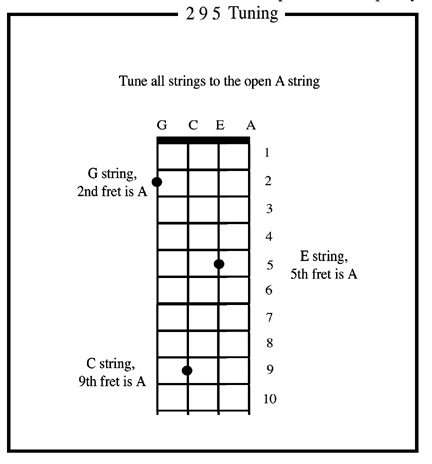 What you do is tune the 1st or A string to A. (of course!) Then fret the 4th or G string at the 2nd fret and tune it to match the A. Then fret the 3rd or C string at the 9th fret and tune it to the A, then the 2nd or E string at the 5th fret, and tune it to the A. As I said before, match the two sounds so that there is no "warble" It may seem hard at first hard but with a little practice it is pretty easy. But what if you don't know anyone with a guitar, don't have an electronic tuner or a piano or a tuning fork? What if you are on a deserted Island. Just you, your Ukulele, and some Coconuts? Do not despair! Have a nice drink of Coconut milk, and then in your best singing voice, sing the scale, "Do Re Me Fa So La Ti Do!" Tune the A string to "La" or somewhere close. Then use the 2-9-5 method as described above.